What’s on display at Kangasala Arts Centre: a permanent exhibition with works by the famous Finnish sculptor Kimmo Pyykkö, as well as temporary exhibitions. 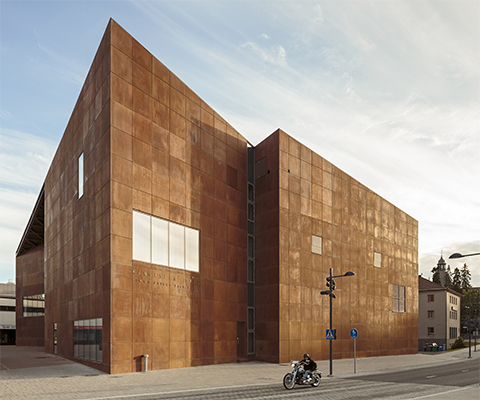 The temporary exhibitions of the Kimmo Pyykkö Art Museum and gallery showcase high-class Finnish contemporary art. The Long-Distance Atelier, which is the permanent exhibition located on the 3rd floor of the museum, contains a cross-section of the personal life and career of Kimmo Pyykkö. The museum’s side programme includes weekly events for all kinds of audiences. Kimmo Pyykkö Art Museum is closed for exhibition changeover 10.9.–28.9.2018. Guided tours for groups are offered on appointment. Please contact the customer service desk of Kangasala Arts Centre: info[at]kangasala-talo.fi, +358 40 773 014. The duration is 45–60 minutes. The recommended group size is 25 people/guide. Prices: 50 € on weekdays, 70 € on Sundays and holidays. Please note that the admission fee to the museum is not included. Guided tours for groups can also be arranged outside of the museum’s opening hours. The museum functions as learning and experience environment for children and adults of all ages. Workshops relate to the temporary exhibitions, or can be tailored specifically to the group’s needs and wishes.